When you are using Outlook on Windows 10, the second notification isn’t likely to come from Outlook (unless you are using a display a New Mail Alert rule) but from the Windows Mail and Windows Calendar app instead. Even when you are not actively using the apps, when you logon to Windows 10 with your Microsoft Account or Business account, it will also try to automatically configure the Windows Mail and Calendar app with those credentials. If it was successful, then you’ll get New Email Notifications and appointment reminders for both Outlook and the Windows Mail or Calendar app. Disable notifications for the Windows Mail and Calendar app. Disable notifications for the mail account in the Windows Mail app. The easiest way to get rid of all the Notifications which the Mail and Calendar app might generate, would be to disable their generic Notification option in Windows Settings. Here, click on the Mail envelope in the “Choose apps to show quick status” section. From the pop-up select: None. In the bottom left corner, click on the gear icon to open the Settings panel. Set the “Show notifications in the actions center” option to: Off. Repeat the above for each account that you have configured or select the “Apply to all accounts” checkbox. If you don’t intend to ever use this account in the Mail app, then you might as well remove the mail account from it. In the dialog that opens, at the bottom below Delete account, click on the link: Remove this account from your device. 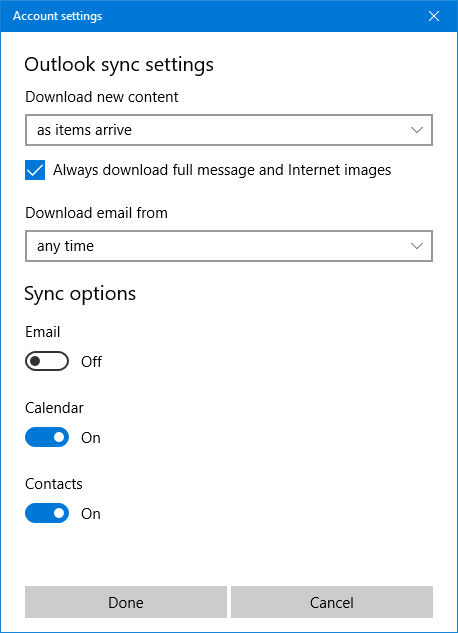 Extra tip: If your mail account is an Exchange Active Sync account (for instance, when your mailbox is hosted on an Exchange server or on Outlook.com), and you want to keep the Calendar info on the Lock Screen, then you can instead click on the “Options for synching your content” link and untick the box for “Email” in the “Sync options” section of the Account Settings dialog.